W. P. Carey Inc. (WPC) is an independent equity real estate investment trust. The firm also provides long-term sale-leaseback and build-to-suit financing for companies. It invests in the real estate markets across the globe. The firm primarily invests in commercial properties that are generally triple-net leased to single corporate tenants including office, warehouse, industrial, logistics, retail, hotel, R&D, and self-storage properties. W.P. Carey is a dividend achiever, which has managed to boost dividends for 17 years in a row. In September 2012, this dividend achiever converted from a partnership form into a real estate investment trust. After this transformation, as well as merger with one of its privately managed REIT, dividend growth has been spectacular, although I expect it to slow down in the foreseeable decade. The company not only invests in triple-net lease properties throughout the world, but it also managed privately held REITs. As a result, its sources of revenues are derived from the stable and recurring rents from those properties, which are usually leased to tenants under long-term leases. Those triple-net leases also allow for rent escalation over time. Under a triple-net lease, the tenant is required to pay all expenditures associated with maintaining and operating the property under lease. 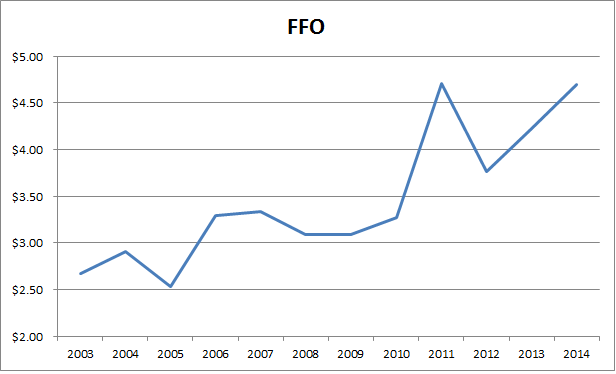 Since 2003, FFO/share has grown by 5.30%/year. Growth in FFO will be delivered through accretive acquisitions for its own portfolio of properties, increasing rents over time, growing assets under management which generate fees. Since 2003, dividends per share have increased by 7.10%/year. I wanted to point out that W.P. Carey converted into a Real Estate Investment trust in 2012 from a Master Limited Partnership. 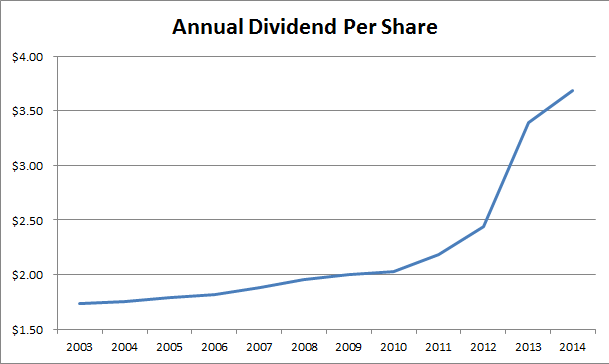 As a result, dividends per share increased rapidly after 2012. Prior to 2012, dividends per share ( or unit), grew very slowly over time. 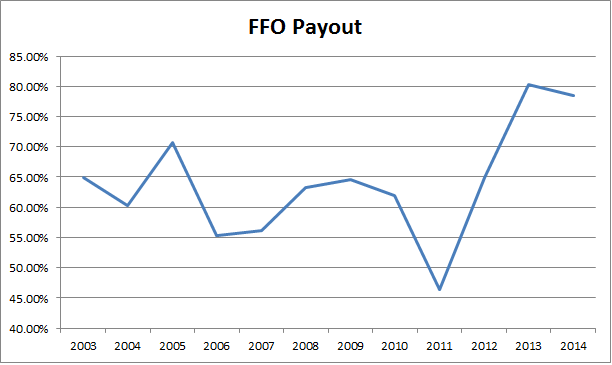 The FFO payout has been increasing from 65% in 2003 to over 80% expected in 2014. This is still sustainable, but means that future growth in distributions will definitely have to come from growth in FFO, since this ratio cannot exceed 100%. I do view the dividend to be sustainable at the moment however. The portfolio occupancy has increased from 89% in 2004 to 97% in 2007, before stumbling again during the 2008 – 2009 recession and bottoming at 89% in 2010. It has been on the rebound and is approximately at 98% as we speak of. I am a little concerned about the fluctuations in occupancy/vacancy over the past decade, since it seems prone to high vacancy rates when times are tough and we are coming out of a recession. I have not seen declines of a similar nature with Realty Income (O), or National Retail Properties (NNN) for example. The other metric I like to look at is tenant diversification. The nice thing about W.P. Carey is that it owns and manages triple-net properties in 17 countries. International accounts for approximately one third of revenues. The top 10 tenants account for 31% of revenues. The current yield on W.P. Carey is 5.30%. I recently initiated a small position in W.P. Carey. I would be more interested in this REIT on dips to 5.50% - 6% or higher yields. I am hopeful that 2015 will be a complete mirror to 2014, and be similar to the latter part of 2013, when everyone was scared from the potential for rising interest rates. Either way, I will probably increase my holdings in this REIT slowly over the next five years to take maximum advantage of dollar cost averaging.